Like many travelers, I became obsessed with pizza while traveling through Italy. It’s unavoidable. It was the late ’90’s, my boyfriend and I had quit our jobs and were taking three months to travel right after I finished my final graduate school course in Rome. To make our limited funds last the entire trip, we’d alternate between really nice and really cheap meals. It’s no surprise that we ate a lot of pizza while in Italy – cheap, plentiful and filling, it made for a good snack or meal. And it was delicious! Truth be told, we ate a lot of everything in Italy. It was glorious. There were authentic Napoletana style pies down south and thick slices sold by the weight farther north. We tried them all. It was where I enjoyed my first real pizza margherita overlooking an old city wall in Naples, discovered incredibly fresh buffalo mozzarella that couldn’t have been more than a day old, and to my delight, a pizza with an egg in the center, the yolk running deliciously every which way. All were wonderful, other worldly. Between the pizza and the gelato, I was happy. I discovered a lot of glorious things in Italy but this is definitely when my obsession with pizza di patate began. 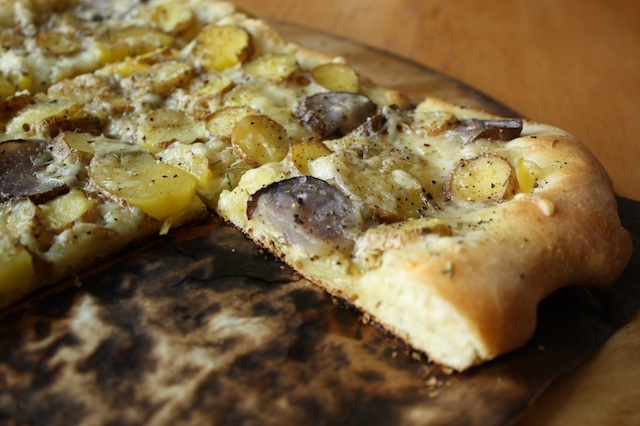 At the time, in my neck of the woods, potato pizza was virtually unheard of. I live in the land of deep dish, not exactly a delicate subtle dish, and a tomato sauced pie was the norm everywhere. Unsauced pies, now commonly known as “white pies”, weren’t really found in these parts. Which was too bad because a potato pie was right up my alley and carbs on carbs is a very Midwestern kind of thing. Going in, it was high on my rather long list of things to try. I just had to find it. I though I struck gold early on, along the Amalfi coast, not far from Naples the alleged birthplace of pizza. While sitting on the patio of a little restaurant, slightly sun burnt with that sense of tiredness that only comes from lazing about in the sun all day, I quickly scanned the menu and saw “pizza di patate”. Having been in Italy for less than a week, this was my first opportunity and I took it. I ordered and happily sipped my wine, watching the sun slowly set over the impossibly gorgeous Mediterranean, the isle of Capri in the distance. What came next was completely unexpected: a large disc of perfectly blistered, chewy crust topped with tomato sauce and … French fries. 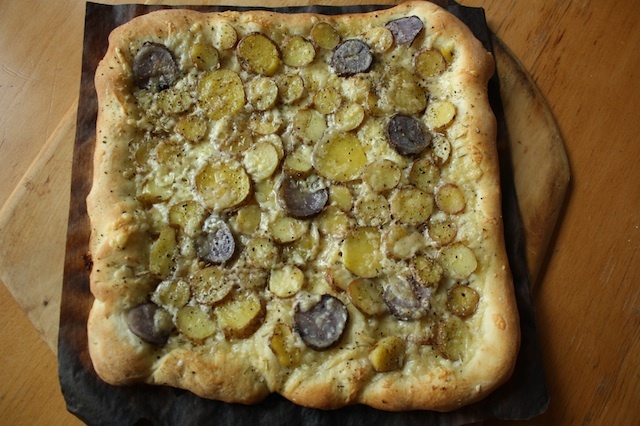 Yes, technically a potato pizza but not at all what I had in mind. I started laughing. 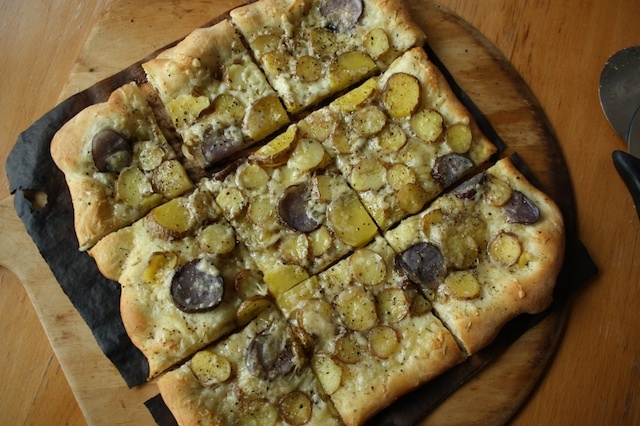 Surely potato pizza was something … more. Right? Later there were beautiful pies, unbelievable actually, in Naples and delicious ones in Rome but no patate. It wasn’t until a few weeks later, in Venice, that I got my chance. We were lost, again, which is one of the best things that can happen in that twisty tunnel-like city. We decided to put the map away and see where the streets would take us. It was time for a snack and as we turned a winding corner we saw a little take-out place with big square wedges of various types of pizza lined up in the adjacent window. And there it was. 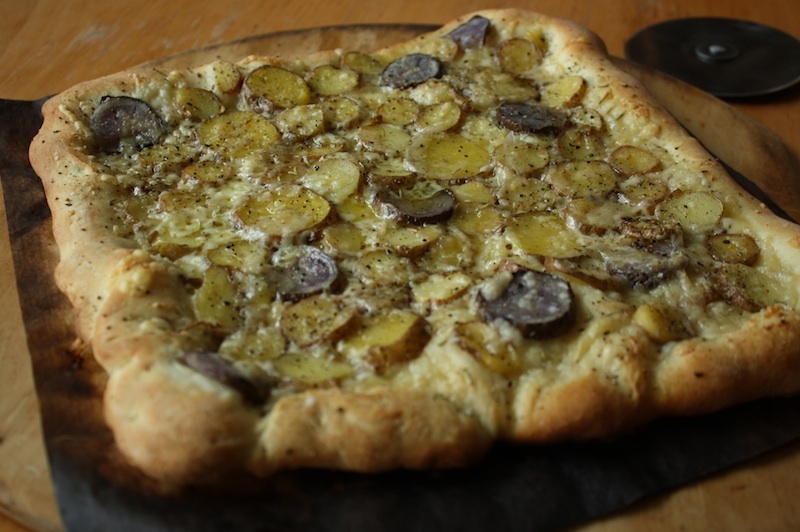 My pizza di patate. It looked exactly like how I imagined: big, thick square wedges with thin sliced potato slicked with olive oil, rosemary and perhaps some cheese. Very different from the thin, blistered round pizzas of the south. To my relief, there was a distinct lack of red sauce and French fries on this one. I negotiated a wedge, trying to wrap my mind quickly around kilos and lira, and dove in. It was amazing, meeting all my expectations. This – this! – is what I had been looking for. I had many slices over that trip and after but nothing quite lived up to that one. Last week as I was cleaning out the fridge, I came across a little cheese leftover from a rather delicious New Year’s Eve fondue. I stared at it for a few minutes and immediately thought: pizza. It was a little of this, a little of that; a mix of gruyere, emmentaler and raclette. Not really enough to do much with but just enough, with some fontina, to make my pizza. I particularly like the combination of a flavorful gruyere mixed with a nicely melting fontina and a little garlic is nice too. Probably not terribly authentic but delicious all the same. That I also had a good handful of multi-colored fingerling potatoes that were right on the cusp of looking a little sad was good too. The dough. We should talk about the dough. 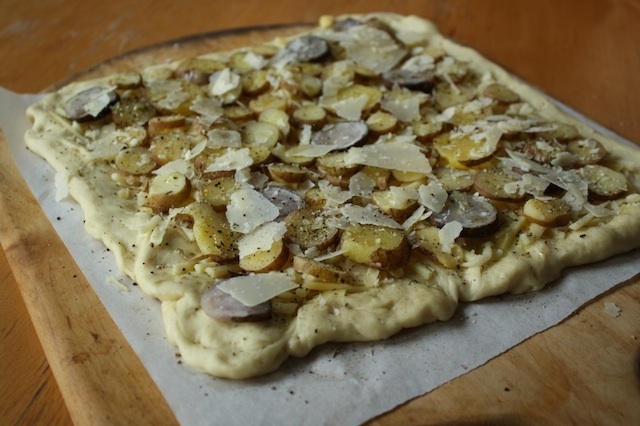 Nothing fancy – flour, surprisingly little yeast, salt, water, sugar, olive oil. The key factor though is time. This dough needs time, 18 hours is best and beside the wait, its really not complicated in any way. Mix together, let it rise and then toss it in the fridge overnight. Take the time and you’ll be rewarded with a silky, pliable, easy to work with dough that makes a fantastic crust – puffy and crispy at the same time. Impromptu no, but most certainly delicious. A quick note – if you want to make really good pizza at home you need two things: a thick, heavy baking stone and parchment paper. First, the stone. Get it really hot and you can come close to getting a decent crust in your home oven. If you can, place it right on the oven floor and leave it there. If you have an electrical oven with an element in the bottom, put it on the rack directly above. The objective is to get that stone as hot as possible; turn the oven as high as it will go – 450°-500°F – and preheat for at least 30 minutes. There’s also the trick of getting the pizza from the counter where you’ve assembled it, to that hot stone. It’s no small feat and this is where the parchment comes into play. If you have a pizza peel, fantastic. If not, turn a sheet pan over or use a big thin cutting board – you need a large flat surface to work as a big spatula. Take a square of parchment, lightly flour the surface and begin to shape and build your pizza. I despise a heavy coating of cornmeal, commonly used to keep the dough from sticking to the peel, and avoid it entirely. The parchment may brown and blacken in the oven but it peels off easily after baking. The paper also makes it all incredibly easy – pizzas slide onto the stone perfectly and most importantly, if you overshoot your mark in the oven, the damn thing can be quickly moved and adjusted. You can also assemble several pizzas without having to wait for a free peel/sheet pan/cutting board. And please note – I’m talking baking parchment paper here, NOT wax paper. STRESS THERAPY BAKING FACTOR: MANGIA! MANGIA! I love this one. Really now, what’s better than garlicky, rosemary potatoes on bread? I can’t recreate the ambiance of eating a slice on a twisty Venice street, or the view that comes with sitting on an old Tuscan wall or the feeling of the Mediterranean blowing back your hair but I can recreate the pizza part of that scenario and maybe, just a little, it takes me back to those wonderful moments. I just wish I still had that tan. I’ve been making this dough for so long, I can’t remember where it came from. I thought it was a Bianco recipe but when I looked it up, it wasn’t. It’s not a Jim Lahey dough either, though I’ve used both and they’re fine recipes too. So to be honest, this dough isn’t my recipe but kudos to whomever I lifted it from. If you were always wondering what to do with purple potatoes, they look quite nice here. Go for small potatoes – they’re easier to work with and look better than a larger potato. For the dough: In the bowl of a standing mixer fitted with the dough hook, add combine the water, yeast and sugar and let sit for a few minutes until foamy. If the mixture doesn’t foam, toss it and get some new, fresh yeast. Add the flour, salt and the olive oil and with the dough hook, mix on low until a coarse ball is formed then increase the speed to medium for about 2-4 minutes until a smooth ball is formed. Turn out onto a work surface and knead by hand for a few minutes until smooth. Pour a bit of olive oil inside two Ziploc bags, slip a ball of dough into each bag tossing gently to coat and let rest at room temperature for 30 minutes, then in the refrigerator for at least 3 hours or overnight. Storage: keep in the refrigerator for up to 3 days or freeze up to 3 months. Defrost overnight in the refrigerator then bring to room temperature. Note: this recipe makes two pizzas. If you only want one, halve the topping ingredients and keep the extra dough in the fridge up to 3 days or toss in the freezer. To bake: remove the dough from the refrigerator and let come to room temperature, at least 1 hour. Preheat: Place a pizza stone on the lowest rack of the oven (or directly on the oven floor if it’s gas) and preheat for at least 30 minutes at 450°F-500°F. For the topping: place the potatoes into a pot and cover with cool water and 1 teaspoon kosher salt. Bring to a boil, reduce the heat to low and simmer until tender, about 10 minutes. Drain and allow to cool. When cool enough to handle, slice the potatoes into thin slices about 1/8” thick. Set aside. In a small bowl, combine the minced garlic, olive oil and a pinch of salt and set aside. Shaping: cut a 12” square of parchment and lightly flour the surface. Remove a ball of dough from the oiled bag and gently stretch it into an 11” square. I prefer to do this by hand rather than with a rolling pin so as not to pop the bubbles that have developed in the dough but it’s up to you. If you encounter any resistance, set the dough down and let rest for 5-10 minutes to allow the gluten a chance to relax then pick it up and continue with the stretching. Gently lay the stretched dough on the prepared parchment, making sure it’s not sticking. Repeat with the second piece of dough and a new piece of parchment. Topping: spread the garlic oil over the surface of the two pizzas, leaving the edges oil free. 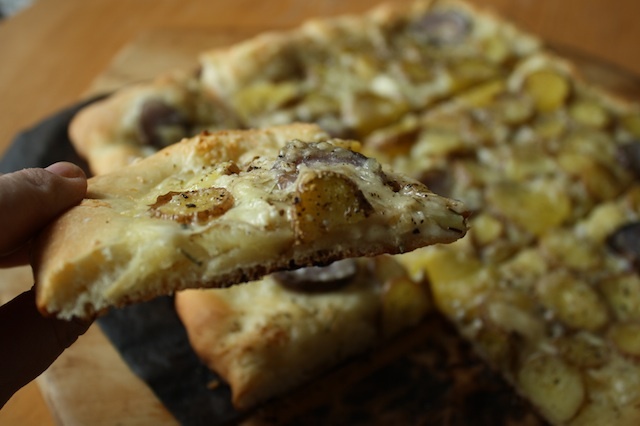 Top with an even layer of gruyere and fontina, a sprinkling of the rosemary, then a single layer of the sliced potatoes on each pizza. Drizzle the potatoes lightly with oil then a healthy pinch of salt and a few grinds of pepper. Sprinkle the parmesan on top. Slide the parchment with one of the pizzas onto a pizza peel, cutting board or the flat, backside of a sheet pan and with a pair of tongs in hand (for quick adjustments if needed), quickly open the oven and with a quick shake/jerk motion, ease the parchment topped pizza onto the hot stone. If you don’t quite place it correctly, use the tongs to grab the parchment and quickly move in place. Immediately close the oven and bake for 5 minutes. Check every 1-2 minutes until the cheese is melted and the bottom crust is browned. This will usually take 7-9 minutes total depending on the heat of the oven. With the pizza peel, remove the pizza from the oven, discard the parchment and let cool slightly before cutting. Repeat with the other pizza. on January 14, 2014 at 1:39 pm | Reply Arthur in the Garden!